Kayaks in the past were used for lazy paddles down the river, but today’s kayaks are used for lots of different adventures. As times have progressed kayaks have become lighter and faster allowing them to become more versatile than ever. With how many different uses people have for kayaks it is important to buy a good kayak anchor. The best kayak anchor is going to be heavy enough to keep you in place, but light enough to ensure your kayak remains nimble. The best kayak anchor has to be small enough to fit into a crowded cockpit, but big enough for you to grab ad handle by the bottom. Why You Need a Good Anchor? A good anchor is needed in order to stop your kayak from moving. Without a good anchor, your kayak will slowly drift along as the water never stops moving. When it comes to kayaking most people never really think about having to stop. A kayak is actually designed to move as efficiently through the water as possible. Its thin and streamlined body design is made to cut through the water with ease. As the kayak is made to move constantly throughout the water, stopping it can be a bit of a chore. If you stop paddling your kayak by design is still going to glide forward throughout the water as water is constantly moving. The biggest reason as to why a good anchor is needed is because without it the kayak simply won’t stop. Even after you quit paddling the water is going to move the kayak slowly along. If you want to remain in a single spot whether it’s to enjoy some time fishing, to make lunch, or just stop to enjoy the view the only way you are doing it is with a good anchor. 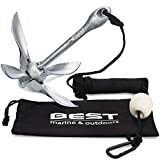 The best kayak anchor to use is a grappling anchor as they will sink to the bottom and dig into the mud, sand, or other debris to prevent the kayak from moving any further. 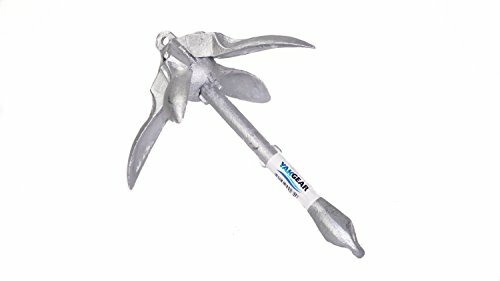 If you don’t have a grappling anchor you can use a mushroom anchor, claw anchor, stick anchor, brush anchor, or a wreck anchor. Here are reviews of the best Kayak anchors available in the market today. This anchor by Airhead is the most popular kayak anchor around. 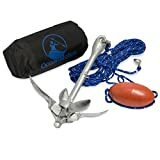 It is a grapnel with 4 flukes and comes with a 25-foot marine-grade rope with an in-line buoy and a heavy-duty stainless steel snap hook. It weighs 3 1/3 lbs. The 4-fluke design is meant to hold in mud, sand, gravel, and rock and is designed for temporary mooring. This kit also comes with a nylon storage bag which is padded for further protection. It also dampens any noise the anchor might make while stored. The anchor itself is foldable and can become highly compact. When folded, it is small enough to fit under most boat seats or in PWC storage compartments and canisters. Like most other kayak anchors, this one too can also be used for small boats, inflatables, and canoes and even for small sailboats. 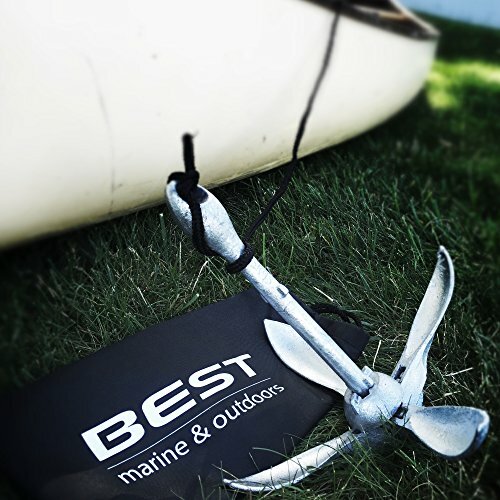 This anchor, by BEST Marine and Outdoors, is extremely popular and it was made for kayak anglers in mind. It is therefore designed to not get in the way of your fishing gear. It is also a foldable anchor, which helps save valuable space in a kayak, and it folds down to just 12 inches x 5 inches. It is a 3.5 lb anchor. It’s made of galvanized iron so you won’t have to worry about rust. It comes with a 40-foot long marine-grade rope and a handy nylon bag for storage. A buoy ball and stainless steel hook also come included. All of this is available for under $30, which makes it great value-for-money. It is easy-to-use, with a liftable collar to unfold the flukes and then lock them into place. The 4 fluke grapple design also works for all sorts of waterbody bottoms such as sandy, weedy or rocky bottoms. It is also easy to use with anchor trolley kits and isn’t just restricted for use in kayaks but can also be used in canoes, small boats, and for paddle boards. 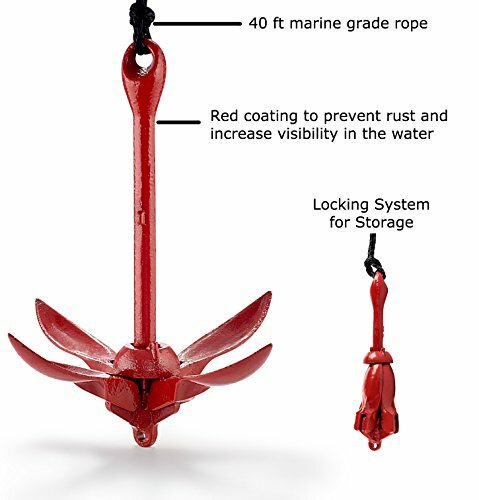 This popular 3.5 lb anchor by Compass Surf is made of steel and comes with a red anti-rust powder coating. It comes as part of a kit that includes a 40-foot marine-grade rope, a buoy, and a stainless steel snap hook. You can store all of these in the 5-liter capacity dry bag that comes free with a purchase. It is made of a durable PVC material with shoulder straps for convenience. Its design is a 4 fluke design that is meant to be extremely effective at grabbing onto bottoms in rocky, sandy, silty and muddy environments. It is also designed to have an easy release when pulling the anchor back. It is foldable, which makes it easy to store in your kayak, and it folds into a compact size of 12 inches x 3.5 inches. It can also be used with jet skis, inflatables, canoes or SUPs. 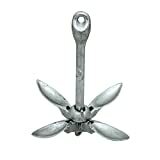 This anchor by Crown Sporting Goods is made of corrosion-resistant galvanized steel which ensures a long lifespan. It comes in a number of different weights, going all the way up to 17.5 lbs. However, for a kayak, you’ll only probably only require the 1.5lbs or 3lbs versions of the anchor. It is designed for short-term inland use and is meant not just for kayaks but also canoes and dinghies. The prongs of the anchor are meant to grab onto jagged surfaces and are recommended for use in coral, stone and heavily weeded environments. It is meant for use in low currents. The anchor itself has a 4-pronged construction and is also foldable for easy and compact storage on your kayak. The prongs are easy to lock into place to give you a secure hold. 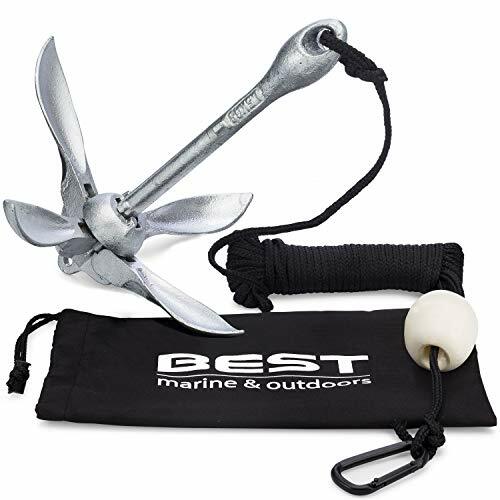 With nearly 200 reviews on Amazon, this grapnel anchor by ExtremeMax is one of the most popular ones around and it’s hard to not see why. 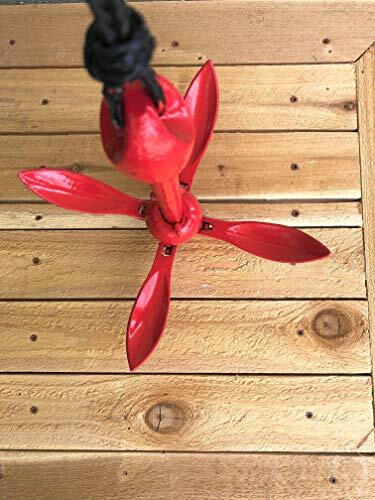 It is a foldable anchor with 4 flukes that weighs 3.5lbs and is both painted and galvanized for resistance to corrosion. It comes with a 25-foot hollow-braid polythene rope with a steel snap hook as well as a marker buoy made of marine-grade foam. It also comes with a durable nylon storage bag which is also padded for added protection. The four-shank design is ideal for use in coral or bottoms which are rocky or heavily weeded. It is meant for short-term anchoring. Like most other kayak anchors, this one also folds down into a smaller size for easier storage. A similar anchor by ExtremeMax is available in case you need a 1.5lbs version, which is the ExtremeMax Red Standard 3006.6782. This is another product with high ratings by ExtremeMax, though it isn’t as popular as the 3006.6548 mentioned above. It comes in 6 different sizes, ranging from 1.5lbs to 13lbs although for kayaking you’ll probably need only the 1.5lbs or 3.5lbs variety. It is made from galvanized iron to prevent rust and corrosion with use. It has a grapnel design and is foldable, making it good for small watercraft which include kayaks along with canoes, dinghies, and John boats. It is recommended that for the best performance you should use it in rocky, grassy, weeded, or hard bottoms in low or no current conditions. Its 4-fluke design is also meant to be easily retrievable. This handy kit by Seattle Sports comes in two sizes: one anchor weighs 1.5lbs while the other version weighs 3.25lbs. While it is fairly popular, it is also more expensive than many other available anchors, with its 1.5lbs costing as much as a 3.5lbs anchor by other brands. Seattle Sports doesn’t offer too much detail about its anchor kit but it states that the kit comes with a long rope of 50 feet, 2 carabiners, as well as a deployment and anchoring ring. All of this comes in a neat drawstring stuff sack for convenient storage. The anchor itself is foldable and is designed for kayak anglers and other small vessels. 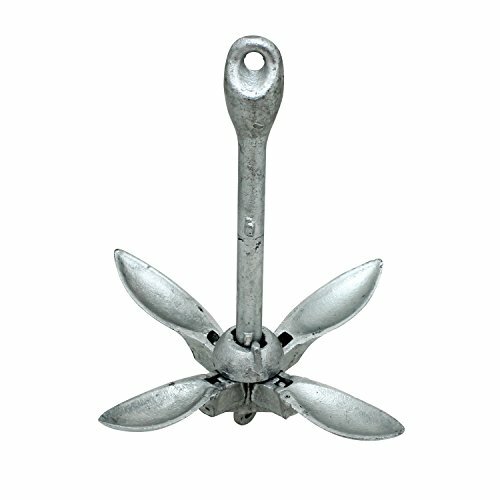 As the name for this anchor suggests, it is a 3.3lb anchor that is made of galvanized iron, which is resistant to rusting and other types of corrosion. 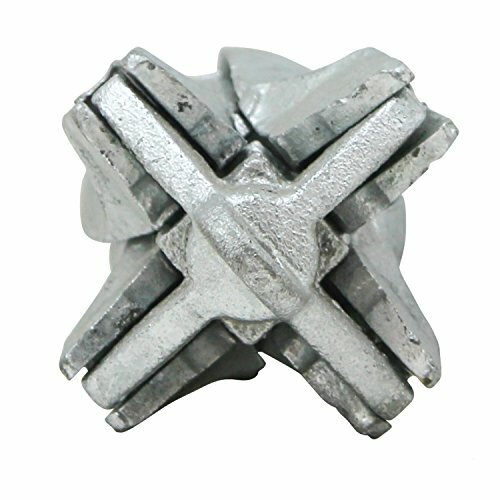 Like all the other anchors on this list, this one also consists of 4 tines which are 6 inches in length and fold in when not in use to minimize space. This allows for easy storage on your kayak. YakGear doesn’t offer too much information about this kit but it states that t is designed so that it submerges quickly even in faster moving waters. This can save you precious time in case you need to quickly anchor yourself to a good spot. 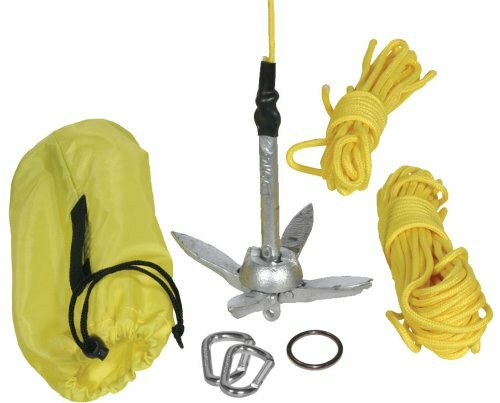 The complete kit also includes 30 feet of 3/16 inch black nylon anchor rope along with a blue ditty bag to keep everything in together. This kit by OceanMotion is designed with fishing in kayak anglers and other personalized watercraft in mind. It consists of a 3.5lb anchor which is made of galvanized iron, designed to weather all sorts of environments and not rust. 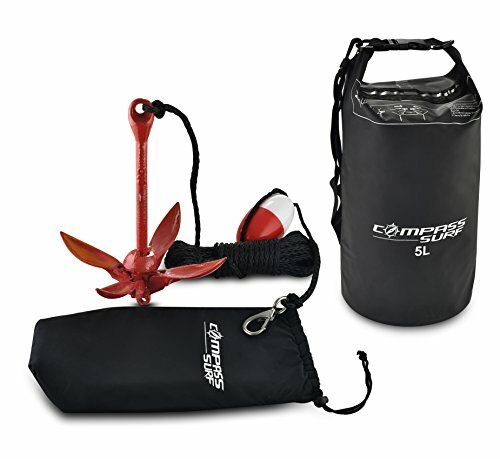 It has an inline buoy to easily locate the anchor when it is underwater and comes with a 40-foot braided nylon anchor rope. This rope is great for using in deeper waters because it comes with a reflective tracer braided into it, making it easy to locate in low light conditions. The rope is also more resistant to UV degradation than polypropylene ropes. Finally, to store this extensive set, it comes with a cinch-top bag for easy storage. 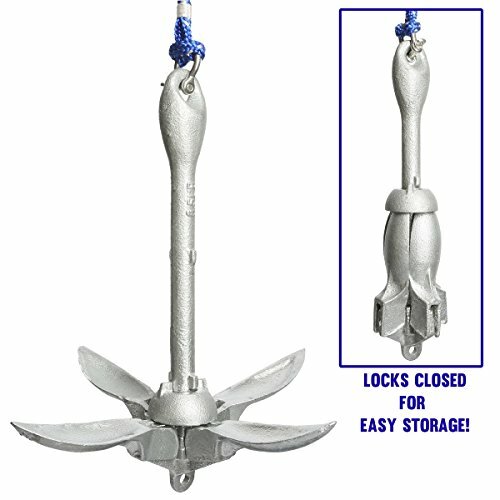 The anchor itself is a grapnel anchor with 4 flukes that fold up for convenience. This anchor system by Advanced Elements features a collared anchor made of galvanized iron, which is resistant to rust and weighs 3 pounds. The other components are a 60-foot long line, a carabineer, a line float. To top it off, it comes with a mesh bag storing both the anchor and the line. It has a standard 4-fluke design which can be pulled back to the shank for a folded anchor that is easy to stow away. It works on most kinds of bottoms, ranging from sandy to rocky environments. It also has a warranty of 1-year given by Advanced Elements that ensures that defects in material or workmanship will be compensated by replacements or repairs. Do I need a Mounting Plate or Other Modifications? How a Kayak Anchor Works? How Heavy should an Anchor be for a Kayak? Why do you Need an Anchor Trolley? How to Attach an Anchor to a Kayak? How to Anchor Kayak in the River? What is the Best Kayak Anchor? Why do I need a Kayak Anchor? Is a Heavy Anchor better than a Light Anchor? Should I Mount my Kayak Anchor? What if my Kayak Anchor isn’t Enough? What Length Rope for Kayak Anchor? When to Anchor your Kayak? How does a Kayak Anchor Trolley Work? The most important things to keep in mind while shopping for the best kayak anchor includes the anchor type, scope, optional accessories, weight and size, and whether or not you can mount the anchor. Regardless of why you are buying a kayak anchor you want to make sure you are buying the best kayak anchor you can find. When looking at the different choices there are a few things to keep in mind to ensure you purchase the best kayak anchor. There are two types of anchors for you to choose from: mushroom and a grappling hook anchors. A mushroom anchor is on the heavier side and uses its weight for anchoring supported, so not the best choice for kayaks. 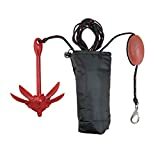 A grappling hook anchor can fold up for easy storage and offers four hooks that grab onto rocks, branches, debris, mud, or sand. The grappling hook anchor sits on the bottom of the water and grabs onto stuff as it is dragged across the bottom. 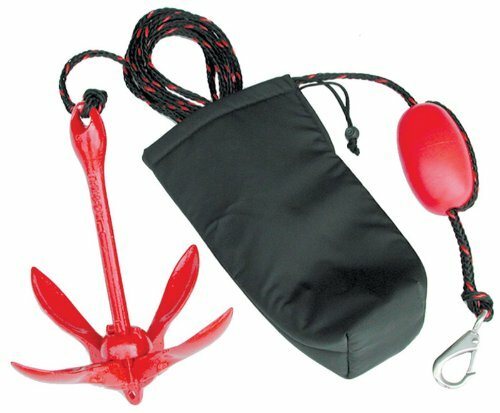 The grappling hook anchor is the most common kayak anchor and an excellent choice. This is something that you need to keep in mind when you purchase an anchor kit that comes with a rope. The scope is the ratio of the length of the rope between the anchor and your kayak compared to the depth of the water. When purchasing an anchor with a rope you want a scope of 7:1. This means for every foot of water you will want 7 feet of rope. The best kayak anchor kits will include a few extra accessories, such as a padded storage bag and a buoy or float. If this is your first kayak anchor you want t get the kit as it will include everything you need. If you are just replacing your kayak anchor you can forgo the kit unless your accessories need to be replaced too. 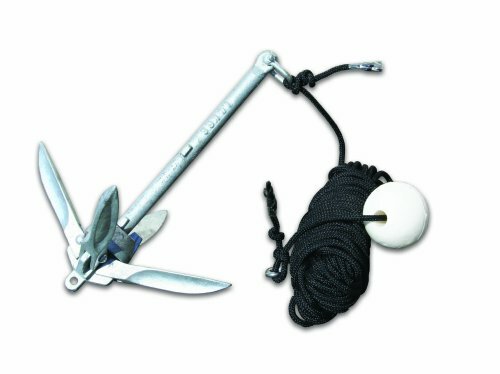 Many anchor kits will come with clips or rings that allow you to attach to your kayak. Weight and size are two extremely important factors to consider when purchasing the best kayak anchor. Size, not the weight, is more important in determining how well an anchor will hold. No matter how heavy the anchor is there is no guarantee that the anchor will bite into the ground and anchor the kayak, there is always the risk it will simply drag along the bottom slowly pulling your kayak with it. When looking at anchors you want to focus more on size and shape. A large anchor with teeth or wings will sink into the silt or mud at the bottom. The teeth or wings can also grab hold of things like rocks, branches, or debris to anchor the kayak in place. A lighter anchor that is larger in size with a decent set of wings will anchor your kayak better than the heaviest anchor with no wings. Many kayaks lack a trolley or dedicated anchor mounting location. Without those things, many kayakers are tempted to just tie off the anchor and toss it off the side. Tying off the anchor should never be done, you need to find a place on the kayak to mount your anchor. The reason anchors need to be mounted is because of the size and shape of the kayak. Kayaks are long and narrow and are meant to take waves head-on. Tossing the anchor over the side causes any wind or waves to hit the kayak from the side rather than head-on. The wind and waves hitting from the side increase the likely hood of the kayak capsizing. You want to find a mounting anchor for the bow or stern of the kayak as the waves and wind will hit the kayak head on as kayaks were designed allowing you to remain safe. Whether you mount at the bow or the stern will depend on your casting style. Whether or not you need a mounting plate will depend on the anchor you buy. The good thing about mounting plates is they can make the anchor easier to use and add some security to using the anchor. Sometimes adding a mounting plate requires modification to your kayak, this can be done yourself or an outfitter. Anchor trolleys often require modifications but are worth it as they allow you to change the anchor’s mounting location as needed. How a Kayak anchor works depends on the style of anchor you purchase. Regardless of the anchor’s style, the anchor stops the kayak and will hold it in place on the water. Different kayak anchors work in different ways. Regardless of what style f anchor you choose the point of the anchor is to stop your kayak from moving in the water. Using an anchor allows you to “dock” your kayak in a single location for an extended period of time. Here is a Quick Look at how Different Kayak Anchors work to stop your Kayak. These anchors are the most popular choice among kayakers because they are very versatile. The anchor has four tines that open as the anchor sinks to the bottom. The anchor falls on its side at the bottom allowing two tines to dig into the mud or sand to securely hold the kayak in place. This style of anchor utilizes a “claw” also called a plow to dig into the bottom. This style of an anchor is not well suited for rocky bottoms but works great for sandy or soft bottoms. This style of anchor looks just like an upside down mushroom. The anchor relies on weight alone to stop and hold the kayak in place. The mushroom anchor will not dig into the bottom, which means it will never get stuck. This anchor only works where winds and currents are not an issue. This is an anchor for shallow water. It is simply a stick that you press into the bottom and then attaches to your kayak. 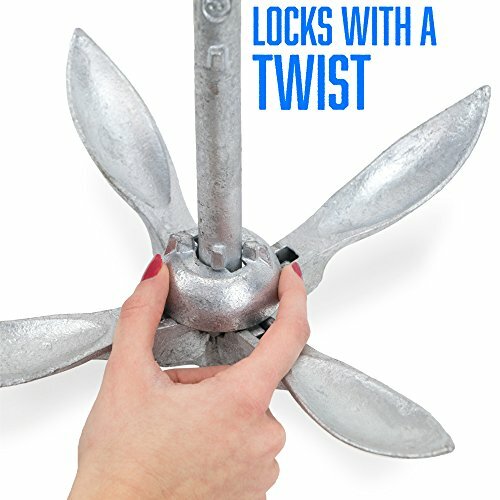 This style of an anchor is a clip that you can use to secure your kayak to an inanimate object, such as a dock, pilings, grass, etc. Once you clip to something you tie the anchor to your kayak in the same way you would tie an anchor. Wreck anchor this style of an anchor is modeled after the anchors on ships. The anchor is designed to snag on debris located along the bottom. The problem is once it’s snagged retrieving it can be a problem. A kayak anchor should be between 1.5 pounds to 3.5 pounds. The exact weight will depend on the weight of the kayak, the water conditions, and the type of weather you are facing. Kayak anchors generally weigh anywhere from 1.5 pounds up to 3.5 pounds, although you can find some that weigh 8 pounds. How heavy a kayak anchor should be will depend on the type of kayak you have and the condition of the water. The 1.5-pound anchor is ideal for an inflatable or other lightweight kayaks in calm waters with nice weather. If you have a heavier kayak, are carrying a lot of gear, or are in rougher waters, or bad weather you want an anchor weighing 3 to 3.5 pounds. Although you can find heavier anchors they are not recommended for kayaks because they weigh too much to carry on the kayak. The reason you need an anchor trolley is to be able to move your anchor from the bow to the stern. Kayakers need an anchor trolley in order to switch the anchor from bow to stern or back again. The great thing about an anchor trolley is it allows you to stay seated in the cockpit while changing the anchoring point. The anchor trolley simply runs the length of the kayak and features rigging with a ring. It is through the ring that you run your kayak rope. The ring of the anchor trolley is the part that is moveable. You simply move the ring from the bow to the stern depending on where you want your anchor. To prevent your kayaking from moving in the water you must use an anchor. Attaching your anchor to your kayak will keep both you and your kayak upright. The only way to stop your kayak from moving in water is to use a kayak anchor. Simply tying a rope to your deck and tossing the anchor overboard increases the risk of your kayak capsizing. To keep both you and your kayak upright you need to attach an anchor to your bow or stern. Step One: Decide where you want to mount your anchor on your kayak. Attaching the anchor to the bow allows you to keep the bow pointed upstream and keeps the anchor rope in sight. Mounting the anchor to the stern allow you to keep the bow pointed downstream. Step Two: Drill two holes into either the bow or stern. The holes need to match the holes in the nylon pad eye. You want the holes to be slightly smaller than the screws you use to attach the nylon eye pad. Step Three: Fill the two holes with marine silicone sealant. The bottom of the nylon eye pad needs to be covered with sealant. Step Four: Screw the nylon eye pad in place. Be careful not to tighten the screws too much as it will crack the eye pad’s base. Step Five: In the center of the kayak drill two holes that match a clamcleat. Before drilling, make sure the clamcleat will be out of the way when you paddle. Step Six: Tie a rope to the anchor using a secure knot, such as a bowline or a figure-eight follow-through. Step Seven: Run the rope through the nylon eye pad back to the clamcleat. Step Eight: Place the kayak in the water you can adjust the depth of the anchor. Jam any unused rope into the cleat. If you want to stop your kayak from drifting along the water once you quit paddling you must use a kayak anchor. Using the right anchor properly is the only way to keep your kayak still even in the strongest of currents. Follow these Steps to Safely and Securely Anchor your Kayak in the River. Step One: Purchase an anchor between 1.5 to 3.5 pounds. It needs to be small enough to safely carry in the limited space of your kayak. Step Two: Attach 50 to 100 feet of nylon rope to the anchor. How long depends on the depth of water you are in. A good rule to follow is 7 feet of rope for every foot of water. Step Three: Attach a foam float to the end of the anchor line. 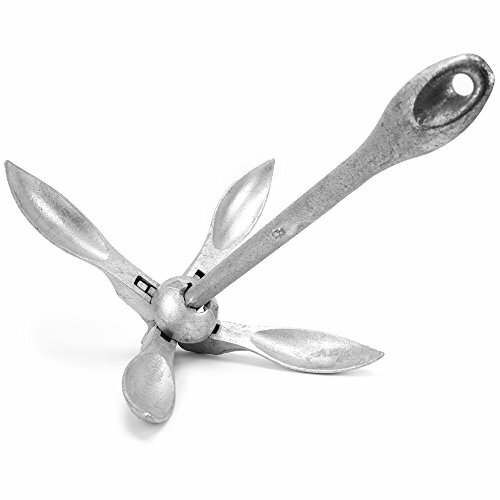 This allows you to retrieve your anchor if you ever have to cut it loose and come back for it. Step Four: Once you are in the location you want to anchor in open the flukes of the anchor if using a grappling hook anchor. Cast the anchor slightly away from you and allow it to sink to the bottom of the river. Once it sinks pull the anchor to help set it into the bottom of the river. Step Five: Feed the anchor line into the water until you have the proper line length based on how deep the water is. Step Six: Tie off the anchor line onto the cleat. The anchor line can be looped onto the cleat using a figure-8 pattern, then the end can be slid under the last loop and pulled tight. The best kayak anchor is a grappling anchor that weighs between 1.5 to 3.5 pounds. The grappling anchor is the best choice for a kayak because it is light and small enough to easily store on your kayak. The grappling hooks deploy and allow the anchor to bit into the bottom or snag up against some kind of debris on the bottom anchoring you securely in place. If you want to stop your kayak and remain in the same place on the water you need a kayak anchor. Kayaks are made to move through the water, so even if you are not paddling the kayak will continue to drift with the moving water. Many people mistakenly believe that a heavier anchor is better than a light anchor for a kayak. Weight is not the most important factor, as many times a heavy anchor will simply slide along the bottom rather than biting into it. Plus a heavy anchor will weigh down your kayak unnecessarily. The short answer is yes you want to mount your anchor to your kayak. Mounting the anchor reduces the risk of capsizing your kayak. You can mount the anchor at the bow or stern or you can mount an anchor trolley instead. The anchor trolley allows you to switch the anchor from bow t stern without having to get out of the kayak. Sometimes when you are anchored you might notice the kayak moving a little bit despite being anchored. This is especially true if you are fishing and are trying to reel in a rather large fish. If you find that you need a little more stopping power than what your kayak anchor provides you should use a drift chute. The drift chute won’t stop you on its own, but it will give you some extra stopping power when needed. The length and diameter of the anchor rope will vary based on the length of your boat and the depth of water you anchor in. When setting up your kayak anchor you need to figure out the size and length of rope you need. Luckily, there are some pretty straight forward guidelines that you can use to ensure you have a big enough and long enough anchor rope. How big you want the rope to depend on the size of your kayak. Generally, you want 1/8 inch diameter for every 9 feet of the boat. If your kayak is 9 feet or less you only need 1/8 inch diameter rope if it’s between 9 and 18 feet you would need ¼ inch diameter rope. For length, you want 8 feet of rope for every foot of water. You want to base your total length on the average depth you anchor in. If you typically anchor in 8 feet of water you want 64 feet of rope. With rope, bigger is normally better. You want to anchor your kayak when you want to remain in one place for any period of time. Properly anchoring your kayak prevents it from drifting along with the currents. There are many different occasions where you will need to anchor your kayak. Some people want to anchor their kayak because they found the perfect fishing spot and don’t want to try fighting the current as they cast a line. Others simply want to take a break from paddling during a long trip, but don’t want to drift along the river as they eat their lunch. No matter the reason properly anchoring your kayak is the only way you are going to get it to hold still. An anchor trolley works as an adjustable anchor cleat. You can move the anchor cleat to the bow or stern without getting out of the kayak. An anchor trolley runs the length of your kayak, but only on one side. The anchor trolley is made up of two pulleys, a rope, and a ring. The rope runs through the pulleys and the ring attaches to the rope. With the anchor trolley in place, kayakers can move the ring from the bow to the stern effectively changing their anchoring point. A huge benefit of an anchor trolley is being able to turn your kayak around without having to pull up the anchor. Anchoring your kayak can be a great way to stop yourself in your favorite spot, whether you want to enjoy the scenery or if it’s a great fishing spot. By anchoring yourself you won’t be subjected to the current nor to the whims of changing winds. There are a number of ways to anchor yourself, like stakeout poles, or even methods to slow yourself down such as drift chutes or drag chains. However, this article will focus on actual foldable anchors, giving you a list of the 10 best kayak anchors by their user rating and usage. With this increased use of the kayak came the need to anchor the kayak in place. As kayaks are made to continuously move through the water, the only way they can remain in one place is through the use of an anchor. The best kayak anchor is going to be light and small enough to store onboard your kayak but shaped in such a way that it will bite into the bottom rather than just drag along. Most of the anchors on this list are quite similarly priced, so choosing between them shouldn’t be too difficult. They all have a history of satisfying users and customers so you should look for the one with the best features, accessories, and ideal usage situations for you.